The Teesside Gazette has launched five hyper-local sites, under the name Your Gazette, based on postal codes in the Middlesborough area in the UK. Interestingly enough, this initiative comes from UK’s largest newspaper publisher Trinity Mirror. It’s interesting to see that a huge company can think about focusing on few people, as is necessary in hyper-local sites. And the five will eventually become 23, Michael Hill, Trinity’s head of multimedia, tells Journalism.co.uk. 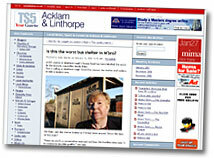 News on Your Gazette include ”Roadworks in your area”, a disabled woman getting a job at the local M&S, a man celebrating his 100th birthday and the worst bus shelter in all of Middlesborough. Yep, that’s local. The focus is clearly on the people in the areas, and the sites are now calling out for bloggers to help filling them with content. There are also links to clips on YouTube made by locals. Verdens Gang in Norway and EkstraBladet in Denmark also have one-point entries into their participatory journalism. Lesernes VG and Laeserbladet are the equivalents of Aftonbladet‘s Läsarbladet (where I’m editor). The idea seems to be the same for all three sites – to gather all, or the best of, the material that the participants (the entities that used to be called readers) have contributed with in one place, for easy access. The three companies use the same platform for their blogs. 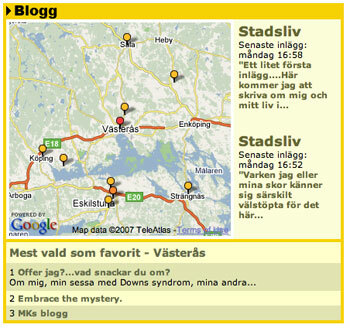 The ”cousins” of Läsarbladet seems even more focused on blogs, though, while I’ve been focusing more on our forums. There are a number of things at Läsarbladet that I’m not finding at the other sites. At Läsarbladet I’ve opened up for submissions of articles as well. But as I’m finding more and more ”quality” blog posts, I think I should promote individual posts more. A good lesson learnt. To put numbers to my initial impressions, I made a quantitative comparison between the three pages Thursday. I realise these numbers vary from one day to the other, but atleast it gives some idea of the different editors’ and sites’ focus. Social media and marketing are merging more and more. The latest example is soon-to-launch Shycast, a brand-focused site featuring sponsored contests where people are asked to send in video clips to win cash prices. Then they get to vote and comment on the clips. Founder Drew Peloso says that he hopes to create a community where brands can reach out to receptive users and engage with them directly. Brands give back to the community by sponsoring contests. According to Arrington, Shycast’s first sposor will be Swedish furniture giant Ikea. Today Aftonbladet‘s launching nine new local sites, which along with the three that was already up, makes up Sweden’s 12 largest cities. Yet one more proof of the local trend in media. 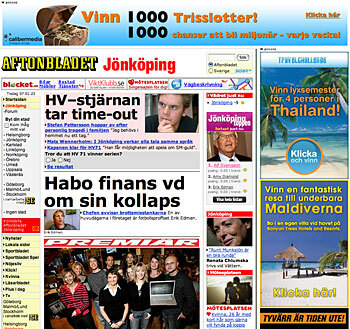 Earlier, Aftonbladet’s main competitor Expressen also launched local sites for ten cities, plus includes links to Expressen-owned local papers in three cities/regions. The two national tabloids have little experience of local news. And this is where bloggers and other citizens come into the picture. Both sites have engaged local bloggers, and allow people to send in photographs and discuss their lives and local affairs. So far the sites haven’t gone hyperlocal though. The money will be shared in proportion to the number of pageviews the user’s clips have generated. The site has only been up for a few days, but it’s growing rapidly every day. Among others, Djurgården’s (Sw. soccer team, my remark) fanclub Järnkaminerna has chosen Tubearound for their exclusive channel for movie clip uploads. This is provided that the site indeed makes a profit. 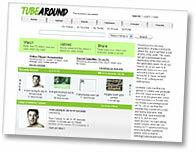 Tubearound hopes that the promise of sharing the money will help draw users from YouTube and other similar services. If the name Andreas La Torre Ek sounds familiar, it might be because he founded Mymilliondollarbody.com, a site where you could buy ad space on a person’s body. I think we have replaced MTV. MySpace is more convenient. You can search for things, while MTV is just delivering things to you. On MySpace you can pick your own channel and go where you want. That’s why TV viewership is dropping among the MySpace generation. MySpace currently has 140 million members. Anderson’s statement follows speculations that MTV might cancel their flagship show ”Total Request Live” due to a gradual decline of ratings. Total Request Live reportedly has some 300 000 viewers. Yes, it sure is a changing world. Young people no longer want to be passive consumers of entertainment.